Robert Douglas Ellery was born on July 28, 1957 to Duncan and Joyce Ellery. He was the 2nd of five children. He is survived by his loving wife, Kim and his daughter Sacha and her husband Scott, his siblings, Lawrence and his wife Jeannette, David and his wife Lisa, Glenda and her husband Randy, and Deanna, as well as nephews and nieces, Chad (Sharrah), Rhiannon (Jeremy), Adam (Hong), Brandon (Candace) and their respective children. Rob was raised by his parents as one of Jehovah’s Witnesses and at 16 years of age, he dedicated himself to Jehovah and was baptized on July 19, 1974 in Smithers, BC. He was a faithful, loyal servant of Jehovah until his last breath. Rob and Kim met at her sister’s wedding. Kim said it was love at first sight, always has been and always will be. They dated for one year and were married in Corner Brook, Newfoundland on June 30, 1979. They recently celebrated their 39th wedding anniversary with close family. Rob was known for his amazing sense of humor, the almost constant mischievous glint in his eye, and for always having a joke for just about any situation. He would often start a sentence with “Did you hear the one about…” You always knew he was up to something when he would catch your eye, wink, and laugh to himself. He loved to entertain and uplift others with humor. He was known for his positive outlook on everything and everyone right up until his death. As a little boy, Rob was constantly getting into trouble, whether it was getting suspended on his very first day of school, coming home with his pockets stuffed full of worms, or “stirring the pot” amongst his siblings. His brothers and sisters have many a story of their brother Rob, they could literally write a book. Fortunately for Rob, his kind heart, soft-spoken voice, endearing manner - and their own sense of humor - made it impossible to stay mad at him. He was a very inquisitive child and loved to take things apart, and sometimes they never worked again! Rob was mechanically inclined and as an adult finally learned to put things back together. 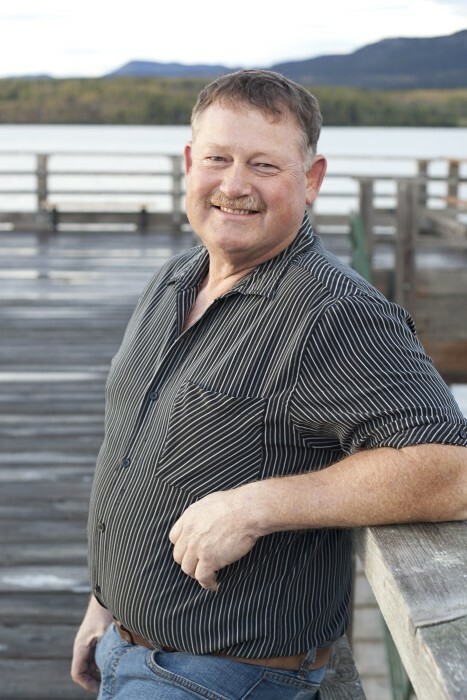 He worked as a millwright apprentice, enjoyed most of his years as a business owner in water treatment, and ended his career life working for the Village of Fraser Lake doing the things that he loved. He was well-liked and respected by all his co-workers and was very kind hearted, generous to a fault, always willing to help others with their work projects, and would leave whatever he had to do in order to help others. Rob’s pride and joy was his daughter, Sacha. Whether it was rubbing her back to help her sleep, building things with her, or teaching her to stand and balance in his hand, he loved spending as much time with her as possible. Sacha fondly remembers how her dad would take her to work with him, and on road trips and they would always get Spitz, Sweet Marie’s and Sun Chips for the drive. He would tell you that being Sacha’s dad was his greatest accomplishment. Rob had a very strong faith in the Bible’s promise of a resurrection of the dead back to life on a paradise earth. He often spoke of all of us sitting together with a cold beverage (or two) in hand, on the lookout for other family members, waiting for the ultimate family reunion. During his years-long battle with cancer, his hope never wavered and he never lost his courage. (John 5:28, 29). Rob was loved by many, loved them in return, and there are many more that are eager to meet him when he returns in the resurrection.